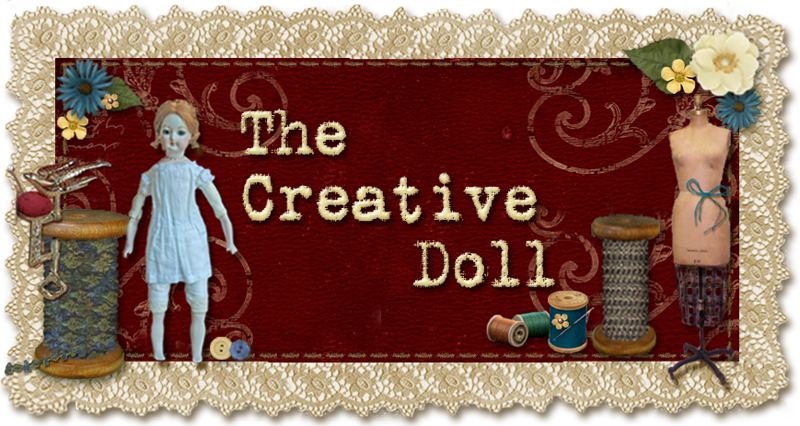 The Creative Doll: Time Flies! I moved two years ago, well a little more than that, and I am still amazed at the time it has taken me to downsize. I am still working at it! And I thought it would take me just 6 WEEKS!! I soldier on. I am in my umpteenth iteration of furniture and where it should go, and selling things an replacing things, but we finally believe we have a plan. We thought so before but that is my story and I am sticking to it. Both of us have lost our parents. My mother-in-law passed away in April. We keep adjusting to our new normal, as does everyone. But we also count our blessings and hope that all of you are able to keep your dolling as a part of joy and that it gets you through your tough spots. It has been since January posting on this blog. And believe it or not, I have done a few things, with a list of a LOT more. I want to do better posting on the blog. (Science and technology have gotten in the way and this is a new try in a new technology for me to upload, so we'll see how it works. If you are reading this, it does, and now I need to perfect it.) All this chasing technology and learning, probably good for my mind, but not my wallet. I would rather be buying fabric. The last Convention I went to for United Federation of Doll Clubs was in Washington D.C. While looking at the display, I and many others, went gaga over the Chiffonette doll and her wardrobe. I attended the luncheon of Sylvia McNeil, and received the book of her doll, it is thought it be a Huret, and have longed to make those child dresses of the 1860's. They are quite simple in look if not in execution. And one can get many looks from one pattern, by changing trims and changing fabrics. Susan Sirkis, long my doll dressing idol, did a pattern CD of the Lilas, and I used her patterns with some adjustments to use for my dolls. So, with so much inspiration form the Chiffonette display and Susan's patterns I went to work on my little 6" Rohmer reproduction. The porcelain for my doll was created for me by my friend Kate, and her body was from Create a Doll. A beautiful tiny leather body. She is 6" tall. I haven't named her. I decided to gather her and her wardrobe together in a shadow box from Michael's. I hope you will enjoy her, and this little interlude will give me a little more time to do more posts to share with you. Many projects planned for the summer. To all the Mothers out there, Happy Mother's Day and I hope all you do is appreciated.